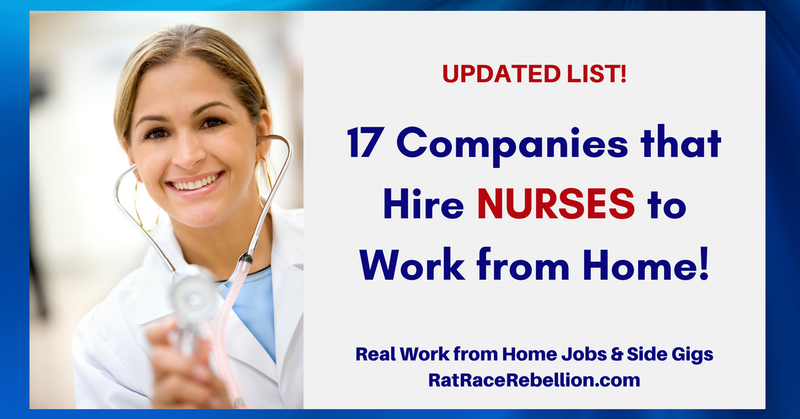 If you’re a Registered Nurse, LPN, or PRN — or know one who’d like to work from home — this list is for you. (Some companies may not have an opening today, but keep an eye on them as all post nursing jobs regularly.) May you be working from home soon! Humana, an insurance company, hires nurses to work from home in a variety of roles, including Care Managers, Telephonic CCR, Case Managers, Preauthorization List (PAL) Clinical Advisors, and others. Some positions may require local travel to visit with patients. Click here to see their work from home jobs. Enter “nurse” (without quotes) in the search field, click the Search button, then look for “Work at Home” under the “Locations” header on the left. Carenet hires Registered Nurses to service their clients via telephone. Roles can include Clinical Care Advisor, Nurse Triage, Medical Decision Support, Medical Device Monitoring Services and others. Click here for details about current openings. Anthem regularly posts jobs for Care Managers and other roles. HealthHelp hires home-based Clinical Review Nurses. Aetna regularly posts positions for teleworking nurses. Sykes hires home-based nurses in CANADA for their telehealth positions. FONEMED hires Registered Nurses to provide telephone triage and health advice to callers across North America. Hiring RNs for a wide variety of positions, UnitedHealth Group has a robust telecommuting program. Hires RN’s for a variety of work from home positions, including Case Managers. Click here for all of their positions, click on “View Current Openings” and scroll to look for RN openings. Many insurance companies have joined the work from home trend, and Cigna is toward the head of the pack. They hire Registered Nurses as Consultants, Clinical Care Managers, Concurrent Review Trainers/Writers, Health Risk Educator Consultants, and many other positions. See their open positions here. Enter “nurse” (without quotes) in the “Keywords” field, select “Yes” in the “Work at home opportunity” menu, and click on the “Search for Jobs” button. The Hartford frequently posts for Nurse Case Managers and other roles that require an RN license. To see their positions, click here. Enter “nurse” (without quotes) in the “Job Title” field, click the search button (small magnifying glass icon on right), then look for “Yes” under the “Remote Worker Option” column. This New York-based health insurance company frequently posts positions for nurses to work as Case Managers. They may require that you train on-site in New York. Click here for their current work from home positions. Hires home-based Care Managers and Utilization Review Nurses on a regular basis. Click here and enter the word “remote” (without quotes) in the keyword field (make sure your location hasn’t been filled in automatically; if so, just delete it), then click on the “Search” button. Periodically posts openings for remote Medication Case Managers and other roles. McKesson periodically hires remote nurses. Click here, then click on “Browse Open Positions.” Enter the words “nurse” and “remote” (without quotes) in the “Keyword” field, then search by clicking on the small magnifying glass on the right. Broadpath sometimes hires remote nurses for roles like Case Manager. Click here to see open positions. Click here to see their current remote positions. For more work from home jobs and gigs, see our Newest Jobs & Gigs page. To be the first to hear about jobs like these, like our Facebook page and check your feed for our posts. May you be working from home soon! This entry was posted in Nurses, Work at Home Jobs. Bookmark the permalink.